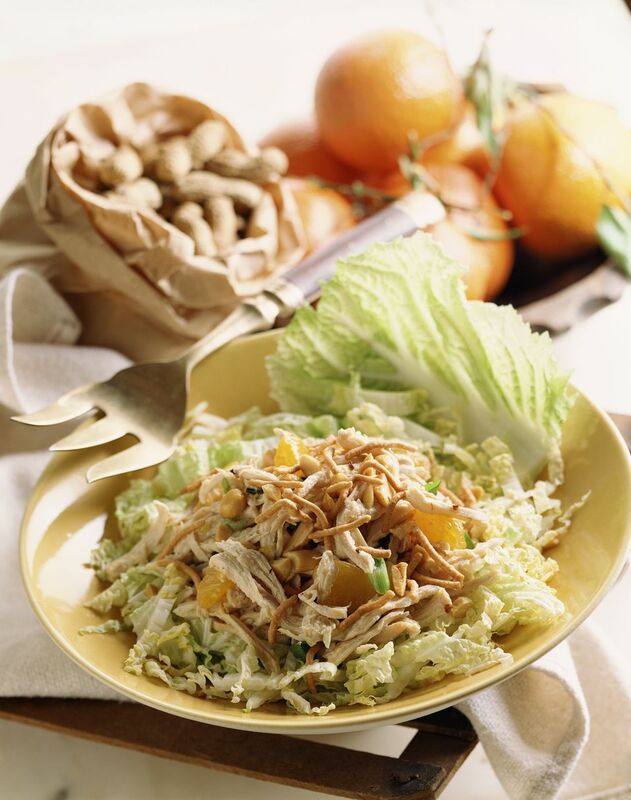 Rice vinegar, Asian sesame oil and soy sauce spike up the dressing in this Chinese chicken salad recipe that includes mandarin oranges and chow mein noodles. Leftovers taste great served in a wrap for lunch the next day. Rinse the chicken breasts and pat dry. Lightly rub the 1 teaspoon of soy sauce over the breasts (use more soy sauce if needed). Place the breasts on a roasting tray and cook for 45 minutes, turning over halfway through cooking. Remove the chicken and cool. While the chicken is cooking, prepare the dressing and vegetables. In a small bowl, combine the rice vinegar, orange juice, light soy sauce, sugar and sesame seed oil. Refrigerate until needed. Wash the lettuce, remove the core and shred the leaves. Cut the bell pepper into thin strips. Remove the cooked chicken and cool. Shred the chicken meat with your hands. Pour the dressing into the bottom of a large salad bowl. Add the lettuce and chicken, tossing with the dressing. Add the red peppers, water chestnuts and mandarin orange slices. Garnish with the chow mein noodles. Sprinkle the sliced almonds or toasted sesame seeds on top if using.